A serious collision outside Hagersville, south of Brantford, left one man dead and two women in hospital. Const. Edward Sanchuk of the Ontario Provincial Police confirmed that the man driving the truck died in the crash. According to Sanchuk, the truck was northbound along Sandusk Rd. and collided with an “SUV-style vehicle” travelling westbound on Concession Rd. 12. Sanchuk said the crash happened at about 7:28 a.m. The SUV rolled, injuring its 52-year-old female driver and her passenger, a 22-year-old woman. Both were taken to hospital with minor injuries. But the pickup, Sanchuk said, veered off the road, cleared a nearby wall and sank into the quarry, which was filled with water to a depth of more than 21 metres. 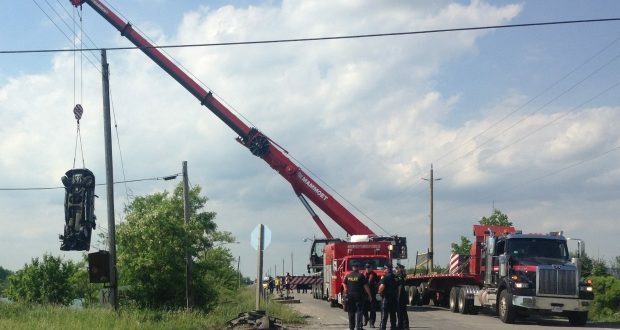 OPP dive teams weren’t able to get the driver out, so a heavy-duty crane had to lift the pickup out of the water. Collision investigators are assisting and police say the investigation is ongoing.